Pour the water into the glass. Tilt the glass slightly and slowly pour in the rubbing alcohol. Don’t shake the glass, or the two liquids will mix. 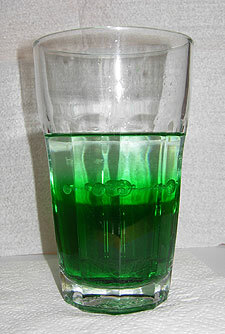 This is the clear liquid on top of the colored water. Fill the eyedropper with the cooking oil and lower the tip into the layer of rubbing alcohol, but not into the water. Squeeze out a couple of drops of the oil. The oil is lighter than the water and heavier than the rubbing alcohol, so the oil blobs float between the two liquids. 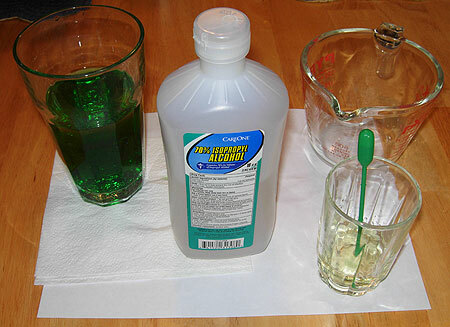 In the photo above, the water is the green layer at the bottom, the rubbing alcohol is the clear layer at the top. You can see the oil blobs in the middle of these other two liquids!